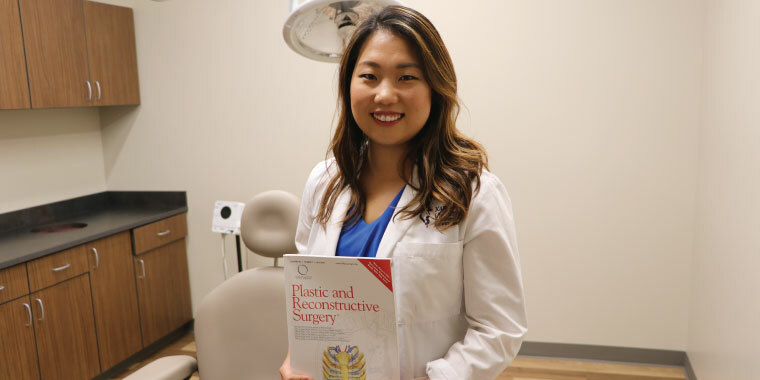 Dami Lee, a fourth-year medical student at KCU, took part in a cadaveric anatomical research project specifically regarding breast reconstruction along with KCU anatomy professors Dr. Barth Wright, Dr. Robert Stephens and Dr.Christopher Surek, who is also KCU alum and plastic surgeon, that was published in the Journal of the American Society of Plastic Surgeons, Plastic and Reconstructive Surgery, a premier source of information for plastic surgeons. The paper is titled "Location of the Internal Mammary Vessels for Microvascular Autologous Breast Reconstruction: The 1-2-3 Rule." Research identified a safer dissection zone using surgical landmarks and measurements to guide surgeons in the operating room when performing the DIEP flap procedure: a process in which the surgeon transfers the abdominal skin and tissue to the breast after mastectomy. Here is what Lee has to say about the publication. What is your reaction to being part of this publication? I’m very excited for our research team. We worked really hard on establishing this zone. The research was the result of hard work and collaboration among everyone involved. We are really excited that we got the article published and then made the cover for the journal. It is amazing. Yes. I had a great opportunity to do the actual work. I feel blessed and grateful for it. And it would not have happened if I had not gotten the chance to have an anatomy fellowship at KCU. Would you say that working on this research project brings all those hours of studying out of a book or in a classroom to life? Definitely. You feel so far removed from the real clinical work as a student. And I actually saw a resident use the rule we created in a surgery. Thinking of all the time in the lab in the basement, dissecting and measuring, seeing our work being used to help a patient was pretty breathtaking. Is it gratifying to help someone who has lost one or sometimes two breasts to cancer? As a woman breasts can be part of someone’s identity and confidence. And I know that after losing a breast through cancer patients can suffer psychologically. Breast reconstruction helps with the psycho social aspect and that is really rewarding. Plastic surgery has many other reconstructions that can restore quality of life and function. I love that. Dami will graduate in the spring of 2019. She hopes to become a plastic surgeon. KCU Student Maaheen Ahmed described being “stranded” by Harvey.